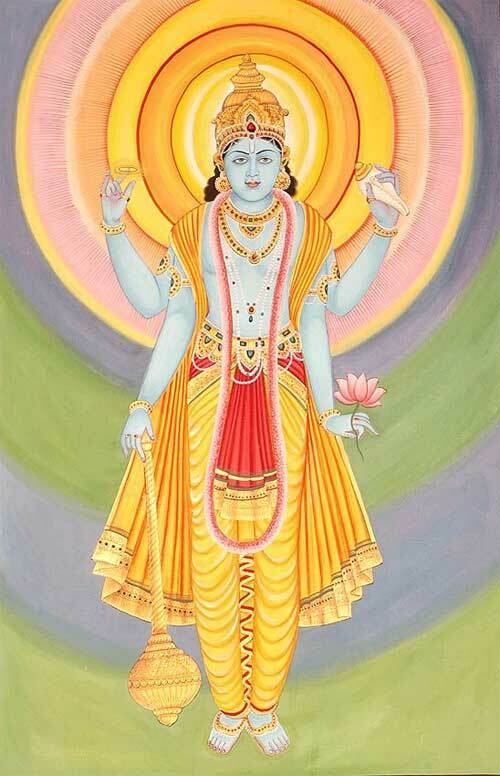 Gopala Tapani Upanishad details as to how one should portray Lord Vishnu in image form. Some scriptures have minor differences regarding the rule. His feet bear the auspicious signs of a celestial standard, a royal parasol. His chest is adorned by srivatsa locks of hair, the brilliantly shining kaustubha gem and rows of forest-flower garlands (vanamala). He is adorned with armlets, garlands, jewels, diadem and earrings shaped like makara the sea monster (makara-kundala). His form is enchanting and auspicious (divya mangala vigraha). He is radiant like the full moon. His eyes glow like blue lotus blossoming amidst the pool of clear water. His eyebrows are like a well-strung bow. His nose slender and shapely like the petals of champak flower. The serene, cool, gentle smile, pure like cow’s milk, dancing on his full and well shaped red lips lights up the whole world. His chin firm and well proportioned. His throat bright and sound shaped like a conch. The tilaka adorning his forehead between the brows is luminous like crescent moon in a clear cloudless sky. His arms long, strong and supple like the elephant’s trunk. His chest wide, strong and healthy. He is the very embodiment of all the grace, beauty and joy in the universe.